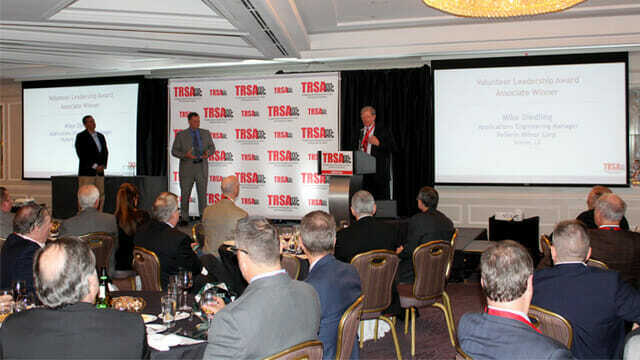 Attendees at TRSA’s Annual Leadership Awards Dinner on March 27 in Washington, DC, heard from the two winners of the Volunteer Leadership Award on the value of participating in association education efforts. This honor is reserved for individuals who are active in TRSA and who recognize the competitive benefits and economic value to their companies of strengthening the industry. This year’s honors in that category for operators went to Liz Remillong, strategic alliance vice president, Crothall Healthcare, Chesterbrook, PA; for associates, honors went to Mike Diedling, retired applications engineering manager, Pellerin Milnor Corp., Kenner, LA.